Can you tell us about yourself and your photographic background? I "fell into" photography. In some ways photography "chose me" rather than the other way around. In that perspective, it seems rather serendipitous or divine - or you could say I had no idea what I was doing when I decided to become a photographer. My background was in finance, software consulting and project management. When I think about it now, it's not a bad mix of skill sets when it comes to the business of photography. 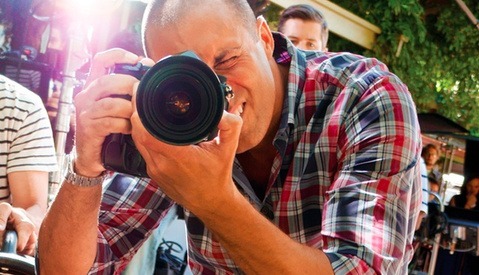 Speaking of skill sets, what would you say is the most important skill set for a photographer to have? That's a tough question, because every photographer reading this knows it's never "one thing." It's a strange mix of everything, and everyone does it differently. But one consistent aspect of photography is that it is incredibly competitive today. It's not good enough to be "just good enough." So I'm going to cheat and say that photographers must have three different skill sets. The first is to be incredibly flexible. Just as you will use duct tape for just about anything to make things work for your shot, you must also be willing to make things work for the business of photography. Secondly, understand what value you provide to the industry, because this is what sets you apart from the rest. Lastly, photographers must persist. Time is a variable that moderates the interactions of all other variables. The more time you can devote to this craft, the more likely someone notice what you're doing and that you will succeed. You also have an educators approach to photography. What got you into teaching workshops? I've always been an educator. As a software consultant, I taught our clients how to use the import component of our software (it was a 100+ page keynote). In my MBA program, I was the TA for Accounting. In college, I tutored students for my calculus professor. As far as photography is concerned, I teach private and group workshops ranging from fashion photography business, lighting, B&W retouching and more. I've also taught at creativeLIVE, the New York Film Academy, and Calumet Photographic. Going back to the question of adding value, what would you say your primary value is to fashion photography? To my clients, I'm a one-stop shop to get everything done. I pull permits, cast for talents, provide creative direction, consult on business strategy, find locations, write the script, shoot the image/video, edit the images/video and everything between. I understand what my clients want from a business perspective; I guess it comes from my business background. I am more capable of aligning my services to my clients' goals. Keeping everything "in house" creates a vertically integrated solution that realizes a more accurate representation of the clients' original vision. The entire workflow is consistent to realizing that vision. Therefore, components such as retouching are never an afterthought. As I sit in the pre-production meetings, I'm envisioning how the pictures look in their final state. This ultimately allows me to push the images in this direction, from prep to post. Of course substance and style must go together. My clients often hire me because they want the style of my images. Usually it's a specific look that they see in my portfolio. They'll pull something out of my work and say, "I want our pictures to look like this." Stylistically, I have value that is unique to me. Whether it is my beauty work for LA Splash Cosmetics or my fashion nudes for treats! magazine, there is a signature look to my images that says LUCIMA so that I don't have to watermark my images. How did you develop your style? Like all photographers in the beginning of their journey, I read books, flipped through magazines and combed the internet looking at different images - old and new. But over time, I looked less and less at what other people were doing and more and more at what I was doing. I realized that what I was looking for couldn't be found in a magazine or on some blog... so I began to look within myself, trying to understand myself better, my processes and what makes me tick. I realized that, by limiting my external influences, I was better able to preserve my internally-driven inspirations and create images more specific to me. Oh, and for the record, my light leak images predate Instagram's date of inception (October 2010). What kind of gear would we find in your bag? It depends on the assignment! I might have anything from a Hasselblad medium format digital/film, Nikon 35mm digital/film body, Canon body/lenses, Sony NEX, even a Diana. How important is gear to you? A while back I wrote a post called "Solving Problems You Don't Have." Basically, it addresses the gearslut problem that many photographers (including myself) experience. Overall, I think that gear is overrated. People put too much emphasis on the tools and not enough emphasis on the vision and execution. That's why, in my creativeLIVE interview, I said that the lens with which I see the world is the most unique "piece of gear" that I carry with me at all times. Improving and refining that lens yields infinitely better results than any gear I could buy. I called it the uber lens. Inside the studio you will find me using strobes, constant light (Mole-Richardson) and some ambient light. Outside the studio, I am typically running around with just a camera in hand and very rarely with a reflector. Where do you find the majority of your inspiration? Beauty. It's a general term, but it goes beyond the aesthetic even though as photographers we're primarily drawn towards visual beauty. Beauty to me is transparent, honest and genuine. Whether it's an architecture or a model's face, it's fundamentally all the same to me. Functionally speaking though, as much as I like buildings and landscape, my goal is to create an image of "beauty" in the female form. As such, I'm inspired by my subjects' beauty whether that is visually, emotionally or situationally (or not). Do you have a preference for shooting still or video and what are the strengths and weaknesses of each? I find video to be a better vehicle for storytelling, because it allows for much more development than any single image - assuming you have an actual concept that is well-scripted. I find still editorial images to be thematically and cohesively unsatisfying, lacking in the storytelling department and relying too much on the viewer's imagination to make up narratives that don't exist. Of course video production is typically more complicated, requiring a great deal of preproduction and postproduction. There's no right answer and each medium has its strengths and weaknesses, and I've explored both in my time. There are times I want to shoot stills and times I want to shoot videos. For short production cycles, there's no replacement for shooting stills. But neither is going away. Ever. L U C I M A | Kate Compton from Charles LUCIMA on Vimeo. What is your mental checklist before a shoot? That depends on the type of the shoot. Some shoots require so much preproduction that my entire shoot is quite literally scripted from start to finish. Other times I don't think about it until the day of the shoot. On those days I am trying NOT to think. Again there's no right answer as it all comes down to what my goal is. There are days that I'm trying to exact a vision that I see in my head and there are days I'm trying to be inspired by whatever I'm given wherever I'm going and basically be a blank slate. In that sense, my mental checklist runs the gamut from everything to nothing at all. What is your thought process for location scouting? When shooting studio, how do you approach it differently? Any good photographer is ALWAYS location scouting. Whether or not those locations are realistic or feasible to shoot is another question. Just as I used to analyze the lighting setup of every image I saw, I now perform this mental exercise regularly, asking myself, "How would I shoot this location?" "Is this a good background?" and even "What makes a good location/background?" I think this last question is the most important one of the three. In a way it answers the other two questions, because once you define your constraints and what you need from a location/background, you can then decide where and how you would shoot a location/background. It's important to remember that this is all preference. There's no right answer. It depends on what you need from your location/background and what you like. What I do in the studio is fundamentally the same approach. I'm big on having the "right approach," because it provides a decision-tree for executing simple functions like location/background selection. Basically I consider what location/background complements the look I'm trying to achieve, and then I negotiate the lighting with that background. I call it a "negotiation process," because, often on location, you can't move the light (the sun) or the background. In the studio you have much more flexibility, so sometimes these skill sets are underdeveloped for studio photographers. Which is why I teach this negotiation process in my workshops. If you have a good foundation for making location/background decisions, it won't matter if you're shooting indoors vs. outdoors or ambient vs. strobes. What is your favorite thing to shoot for yourself? Based upon the collection of photos in my iPhone, that would be my 1-year-old daughter. What do you do on your down time? Mostly sports. Lots of cycling, running, and some surfing. I did an Ironman Triathlon in NYC last year. Lots of my exercise can also be categorized as location scouting. Nothing unusual really. What has been your most memorable moment in your career so far? It wasn't an image but rather a video. I shot a fashion video titled "LOST" that was featured on Ben Trovato. FashionTV contacted me and asked for the right to broadcast the video to "350 million households in 150 countries." I don't subscribe to FashionTV, so I didn't know if they had actually aired the video. Then in December last year, as I was sitting in a pub in Taipei, Taiwan, I saw my video projected onto the pub wall. At first I was very confused because I didn't understand how the pub got a copy of my video. It took a few seconds to realize they were showing FashionTV! Lost by Charles Lucima on Ben Trovato from Ben Trovato on Vimeo. What's the one thing you wish you had more of? Time! This month alone I've been to the the Caribbean, Seattle (creativeLIVE) and Death Valley (Destination MARS workshop). I have a copy of Grand Theft Auto V collecting dust, but there's too much work to be done! I'm already in preproduction to shoot another line of cosmetics as we speak. What defines the decisive moment of your photographs? Lately I'm exploring more and more elements that I can only describe as "je nai sais quoi." Of course, as an educator it is uncomfortable for me to admit that there are elements of photography that I can't explain - elements that transcend language, communication and consciousness. Perhaps that's the point. If you can explain it via a checklist, then it is easily replicated. When the image seemingly breaks multiple "rules" and yet captivates you on an emotional level, the experience is transcendental. Functionally, it's the right model, the right photographer, the right location, the right moment, the right expression, the right lighting and a lot of luck. See more of Charles Lucima's work on his website, and follow him on Tumblr. Don't be sad he's done a lot of different things to make it successful. Specifically he teaches at a film school, lots of workshops and his photography clients... its not just one thing... it's also not the formula for everyone. Nice shot at the Lautner house. Wish it was squared up. Great interview, though. Nice work on these interviews Chris, I'm loving them, keep them coming! Yes, it is quite a popular location and a huge architectural landmark in LA.